I bring my fingers to my stomach, digging into the skin until I feel red under my red nails, red, my red, me, until what I feel is something outside of me, until it's something I've done to myself. Instead of her face, I see a sign that says FIND ROMY. I wonder what it's like to be missed. Wherever Penny is now, she has to know what it's like to be missed. Wherever Penny is now, she has to know what she's inspired, that she's being searched for because people want her back. What would happen if it was me? Maybe they'd forget. Maybe they'd like me better. Would that even be possible? I think I'd trade places with her to find out. Either way, I'd get to disappear. Quite simply put this was a well written novel, on yet another subject that society tends to sweep into corners. Girls and women alike often suffer in silence because society has taught them that it is "their fault" that this has happened to them. The ones that speak up often face accusations and the few that get some form of justice, still suffer. All the Rage gets you attached to characters and then makes you bleed for it. Not because they turn but because your heart breaks for all that they go through. The pacing, plot and characters were basically perfect. Once I got through the first few chapters I found that this book did not want to be put down, and called to me every single time I had to put it down. It's not that it was filled with action but more a point and a life. Simply put All the Rage is filled with Romy's life after the assault, and how one moment is all it takes for everything to change. For a girl that saw a full life to feel dead, to see black where there was once color. Romy was portrayed very well. It's hard to explain why I felt she was so realistic, but there was never a moment that I found myself questioning why she reacted as she did. The sad fact is that Romy faded out because no one would believe her, because she was the girl that made the choice to be victimized... Well, honestly no one makes that choice but that's what it was made out to be for her. It was hard watching her try to keep her worlds separate sometimes, finding it easier to keep to herself than let others in. There was the wish that she would not let others push her around, but fact of the matter is that it is hard to stand when broken, and Romy had something stolen from her that no one could get back. There are so many moments that I felt I had everything worked out in my head, followed by moments that I wished what I had thought was true. I can't say that I shed tears but my heart did pull for Romy and so many others in this read. 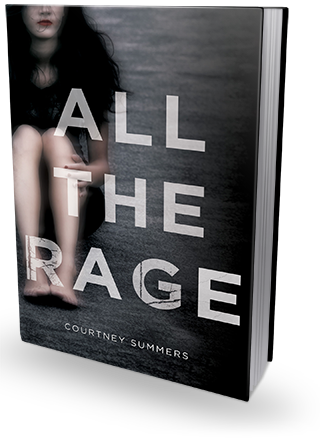 All the Rage was the type of book that will stay with people long after putting it down, twisting and calling readers back to the hurt and lessons learned. I would recommend this book to people that enjoy contemporary reads and characters that live in the true shadow of their past.